Many organizations ask us for a convenient way to review and visualize usage and billing information across multiple subscriptions. Today, this is a complicated problem to solve due to access restrictions on billing information. 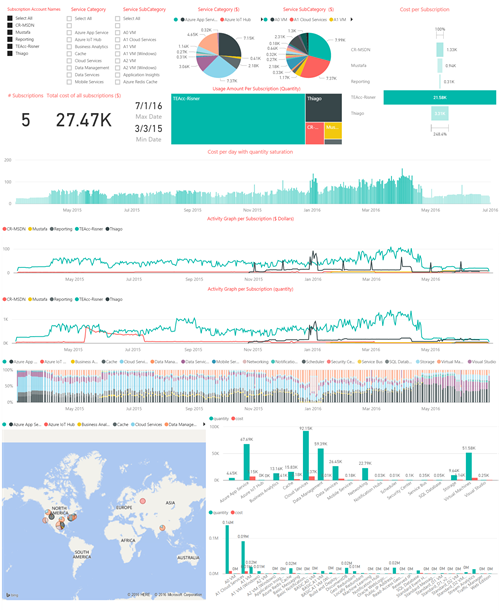 Last year, we announced the availability of the Azure Resource Usage and RateCard APIs. These APIs provide programmatic access to the usage information for a subscription as well as the billing rates for Azure usage for different rate codes. Used in conjunction, these APIs enable you to see not just what your consumption of different services over time are, but also to see how much that consumption costs. Until now, it’s been up to you as developers to bridge these APIs to acquire this level of intelligence. This release is just the start of what we’re hoping to accomplish with this project. In the future, we plan to add the ability to trigger alerts based off unusual Azure usage, provide additional reporting, enable per-subscription rate codes, simplify deployment, and much more. As you begin using the Azure Usage and Billing Portal, we hope you’ll provide feedback and contribute any improvements you work on. Fortunately, we’ve done the work of creating a Powershell script which will generate all the necessary Azure resources you’ll need to deploy your own version of the Portal. You can follow along with step-by-step instructions to generate those resources, update the necessary configuration files in Visual Studio, and deploy all of your projects into Azure. The Azure Billing REST API Reference provides details of the two APIs used to pull usage and RateCard information. The Azure Billing API Code Samples contain examples of using those APIs. Of particular importance is the Multi-Tenant Web Application sample which demonstrates how the consent process for the Registration website works.